PowerPoint to Video Converter is a functional application which can supply an innovative way to convert PowerPoint presentations to Video files of excellent quality with all the original animations and sound effects retained. PowerPoint to Video Converter allows you to convert PowerPoint presentations to popular video formats such as AVI, FLV, MP4, etc. You can share the converted Video files on various video hosting websites such as YouTube after the conversion. PowerPoint to Video Converter allows you to record PowerPoint to Video within some easy steps and preserve all elements like the animations and transition effects in the original PPT presentation. PowerPoint to Video Converter can be used to convert PowerPoint presentation to flash files which are saved as SWF and FLV and so on. After the conversion, you can share the flash on video hosting websites. PowerPoint to Video Converter offers the function of specifying the frame size of output video files by setting the frame width and height for obtaining different sizes of videos. Support multiple PowerPoint files as input. Convert PowerPoint presentations in batch. Support to customize the output video frame size. Support to create videos that can be played iPod, iPhone, PSP, and BlackBerry. Input formats: .ppt, .pptx, .pps, .ppsx, .pot, .potx. Output formats: .avi, .swf, .asf, .flv, .mov, .mp4, .mpg. Transform your PowerPoint presentation into video, and easily upload it to YouTube in one click. Save PowerPoint presentation as mp4 video with all animations and sounds perfectly preserved. Preserve All PowerPoint Effects in Video Format. Support even the most sophisticated features of PowerPoint 2007/2010/2013/2016/laters. All images, audio and video that you select to insert in your presentation will stay crystal clear after conversion. All text objects will keep their size, position, style, font, color, bullets, and other formatting in your video presentation. Any transition effect that is played in your PowerPoint presentation will be precisely converted into video. Convert PowerPoint to YouTube in one click. 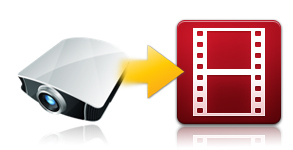 Convert PPT to video formats: MP4, WMV, MOV, SWF, MPEG, AVI, FLV, and more. Save presentation videos for mobile devices. Add soundtrack or voiceover to your presentation. Make HD videos from PowerPoint presentations. Embed presentations in your blog, share them on the web. 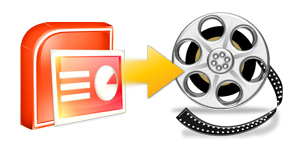 One click to convert PowerPoint files (PPTX, PPS, PPTS, PPT) to video. Optimized video formats for playing on computer, tablet and smartphone. Keep complete features and effects of the original PowerPoint files. Detailed output video profiles for web services and end-devices like YouTube, iPad, iPhone and more. Batch conversion for PowerPoint files with absolutely no number limit. Convert PowerPoint to Flash, PDF, PS (PostScript), HTML and MHTML and RTF. It also can convert slideshow to raster and vector images. Convert PDF to PowerPoint (PPT) with high quality. It can maintain the original layouts, hyperlinks, colors, graphics, etc. in the result PPT files.